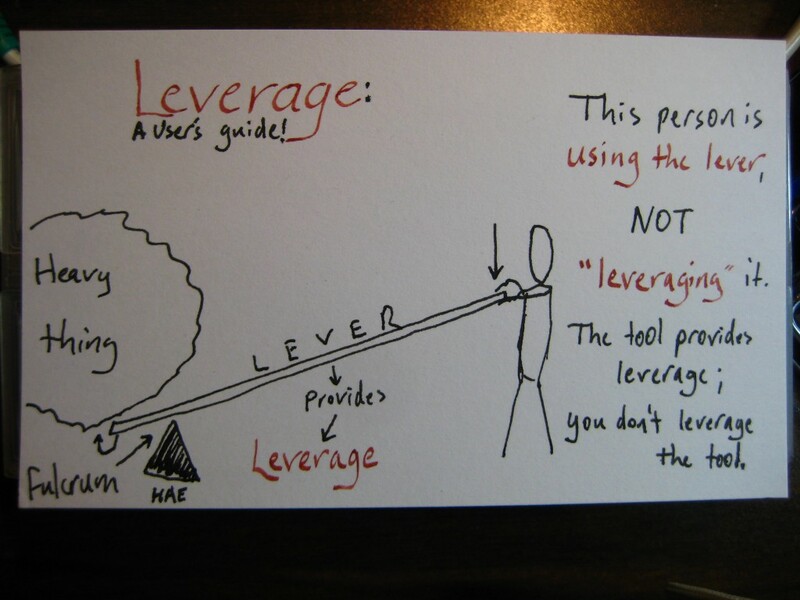 Leverage is an abstract term relating to levers. Some people use it to refer to the specific force-multiplication ratio offered by the lever (e.g., 4:1 leverage vs. 8:1 leverage), while others use it to describe the state of having access to adequate levers (“She’s got enough leverage for that” basically means “she has access to a big-enough lever to accomplish what she wants”). Some people use leverage as a verb. These people are wrong. You use a lever to acquire leverage. The lever provides the leverage, in the same way that a car provides transportation and a burrito provides nourishment. You would not say “I transportationed that car!” when you mean that the car transported you from here to there, nor would you exclaim that you had “nourishmented the heck out of that burrito” when you meant that you had eaten the burrito and extracted delicious nourishment from it. Similarly, you should not say that you leveraged tools when you actually mean that you used the tools to gain leverage. It makes people lose their minds, and some of them will want to grab their levers and leverage you with them. Did that make sense? No? Exactly. *: If you remember the dude’s name, you probably also remember how to use “lever” and “leverage”. Congrats, fellow pedants!